Description: Sexes similar. Long reddish legs distinctive. Glossy black back; long, thin black bill; and white underparts and eyebrows. Female is browner above. Food: Eats almost exclusively aquatic insect sight smaller quantities of fish, reptiles, and amphibians. 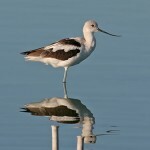 Habitat: Alkaline ponds and marshes. Where in Nebraska: Rare spring migrant. 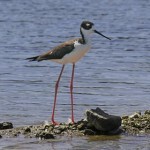 Recent nesting records at Crescent Lake National Wildlife Refuge. 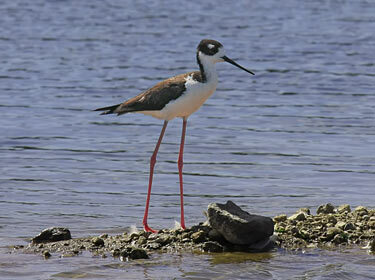 Fun Facts: Black-necked Stilts have the second-longest legs in proportion to their bodies, exceeded by only flamingos!